Other than tartness, both berries are pretty well interchangeable. And if you like dessert with a bit of a pucker, you can leave the sugar out of most recipes. Things like jam and sauces that need thickening should have sugar or an artificial sweetener and something else to give the fruit body. 1. 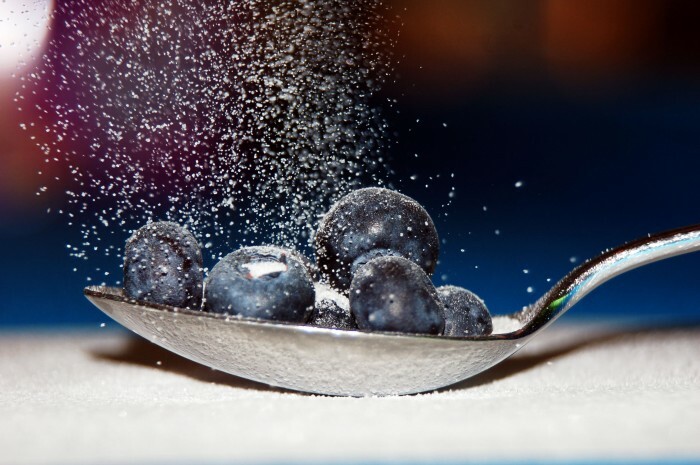 In a small sauce pot, combine two pints blueberries, sugar, lemon juice, and water. 2. Place sauce pot over medium high heat. 3. Stir contents of pot as it comes to a boil, reduce heat to simmer. 4. Cook blueberry mixture for 20 minutes or until it coats the back of a spoon. 5. Strain blueberry sauce through a sieve if desired. 6. Let blueberry sauce cool to room temperature, and store in the refrigerator until needed. 7. Top the cheesecake with some of the cooled blueberry sauce, leaving extra for garnish. 8. 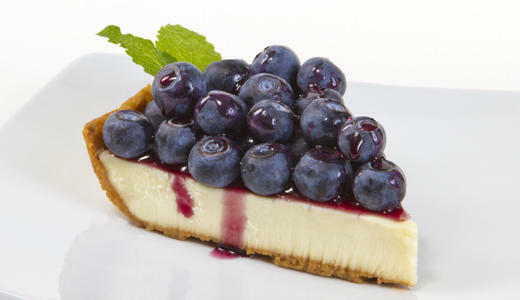 Place fresh leftover blueberries on top of the cheesecake and garnish with fresh mint. 9. 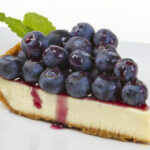 Serve the blueberry topped cheesecake with extra blueberry sauce. “Blueberry Shortcake” doesn’t fall trippingly off the tongue as does old favorite “Strawberry Shortcake,” but it will make your mouth smile when you taste it. If you use fresh berries in your strawberry version then you can do the same with blueberries. Thawed berries trade for thawed berries. Slightly cooked stand in for slightly cooked. A little sugar is nice on blueberries. Try a few different ones for different textures—icing, granulated, light brown, turbinado, and palm sugar each give a slightly different result when the berries hit the cake or biscuit. Icing and granulated can disappear. Turbinado and palm sugar stay as crystals on the surface if you serve them soon after sprinkling. Individual strawberries dipped in chocolate are a fancy and festive dessert. It is difficult to do that with blueberries, no matter how big, because they are too hard to hold and not get your hands finger-licking chocolaty. Choose to do a few at a time in clusters, as you would peanuts or raisins. Lower some into molten chocolate and fish them out when they are well coated. Corral the berries in a puddle of chocolate on waxed paper and let it solidify. You can choose to make a few large ones instead of a bunch of small ones. Pour the blueberries and chocolate onto saucers you have sprayed with non-stick spray or lined with waxed paper. A few chopped pecans would not be a bad choice in large blueberry clusters, either. Serve the maxi clusters with vanilla ice cream or whipped cream . . . with or without more blueberries or blueberry sauce. Moosewood Restaurant Favorites cookbook, a Christmas gift, has a great recipe for Fresh Berry Ricotta Mousse that works with strawberries or blueberries or, for that matter, just about any berry. Start by whipping two cups of ricotta cheese with a processor or mixer until it’s very smooth. That takes a couple of minutes. Measure out a half cup of blueberry fruit spread (jam or preserves you made from last year’s crop). Pick the prettiest blueberries from a pint and set them aside. Fold the berries and spread into the whipped ricotta and put it in the fridge if you’re not going to serve it soon. Just before serving, whip a cup of heavy cream until stiff. Fold it into the cheese mixture. Serve in nice dessert dishes with the pretty berries on top. Of course, you can choose to use whipped topping in place of the cream. Crumbles make nice dinner desserts when the main course is casual, at least less fussy than Beef Wellington. Forget the strawberry version and go for the blueberries instead. You need about six cups of berries for six servings. Toss the berries with a little lemon or lime juice and some citrus zest. Add ¾ cup brown sugar and some cardamom. Taste for balance before adding a tablespoon of cornstarch. For the topping: Whirr a cup of white flour, one cup chopped pecans, a half cup of sugar, and a pinch of salt until crumbly. Mix in 1/3 cup vegetable oil. Divide the berries between six baking cups or bowls on a cookie sheet. Spread the topping over the fruit and bake about 45 minutes at 400 degrees. Serve hot, warm or at room temperature with or without cream or melted ice cream. Life’s the berries—red or blue.